New Delhi: Maruti Suzuki India Ltd posted the first decline in net profit after 17 quarters as car sales stayed weak due to rising auto fuel prices, higher loan rates and worsening macro-economic factors. India’s largest carmaker by sales was also hit by higher raw material costs, and depreciation and amortization expense. 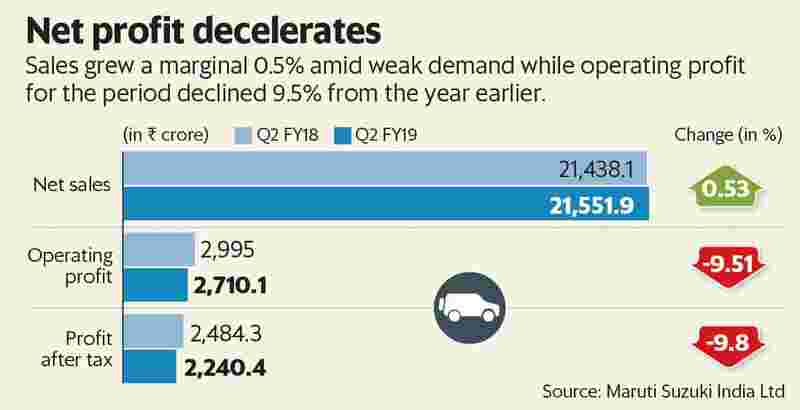 Maruti’s quarterly performance is an indicator of the tough road ahead in the second half of the fiscal as it is considered a bell weather for the Indian automobile industry. Senior executives at the Suzuki Motor Corp. unit however maintained the aim of recording a double-digit sales growth this financial year. They said however that the fiscal second half will continue to witness slowing down of retail sales and will be full of uncertainties until the sharp rally in global crude oil prices is contained. Suzuki’s most profitable subsidiary reported a 9.8% drop in profit of ₹ 2,240.4 crore last quarter, from ₹ 2,484.3 crore a year earlier. The profit however beat Bloomberg’s estimate of ₹ 2,023 crore. Net sales grew a marginal 0.5% to ₹ 21,551.9 crore amid weak demand. The weakening of the rupee and increase in commodity costs led to a 5.7% rise in raw material expenses, which along with a 5.6% increase in depreciation and raw material costs hurt operating profit. Maruti’s factory dispatches of vehicles or wholesales fell 1.5% on-year in the second quarter to 484,848 units. “The volume growth should improve going ahead since majority of the festive demand falls in Diwali and Dhanteras," said Bharat Gianani, research analyst at brokerage Sharekhan. “Maruti is expecting volume growth to pick up. Further, the impact of Kerala floods is also receding gradually which should also support volumes," added Gianani. Operating profit or the earnings before interest and tax (EBIT) for the period also declined 9.5% from the year earlier to ₹ 2710.1 crore. Operating margins also contracted 140 basis points to 12.57% in the same period. R. C. Bhargava, chairman of Maruti Suzuki, said the company will try to attain its target of 10% volume growth for this fiscal year but expects market uncertainties to worsen in the second half. “The increase in international prices of crude and its consequent impact on India has been quite significant. The recent announcement regarding the third party premiums have also increased the cost of vehicles and impacted their affordability," said Bhargava. Due to low retail demand, Maruti’s average discounts increased by ₹ 3,000 while the realization per unit rose just 1% during the quarter. Also, the depreciation of the rupee against the dollar hurt margins by almost 120 basis points last quarter. Maruti’s second production line of 0.25 million vehicles at its Gujarat factory will go on stream over the next few months, which will further augment capacity at a time when automobile demand has nosedived in India. “This time the festival period sales may not be substantially more than last time as the market is not showing much buoyancy," said Bhargava. While demand has slowed in the urban areas, three consecutive years of near normal monsoons and increased spending on improving rural infrastructure have led to a 15% increase in rural sales for Maruti.